Dental implants and bridges are replacement options for missing teeth. Our Delta dentists take the following factors into consideration when prescribing either of these teeth replacement options. Invisalign is a inconspicuous orthodontic appliance that straightens your teeth without any metal or wires. Read on to find out how long the Invisalign process might take for you. At Surdel Dental, our Delta dentists provide oral sedation options for patients who feel nervous about undergoing dental treatment. Here’s how the oral sedation process works. There are many over-the-counter teeth whitening products available, but professional whitening systems are safer and more effective. Our Surrey dentists explain why. It’s important to know what healthy gums look like so that you can tell whether yours are or not! Our Delta dentists describe some of the ways that can tell the difference between healthy gums and unhealthy ones based on appearance. Invisalign aligners are removable, which make it easy to clean your teeth during treatment. But you have to keep the aligners themselves clean, too! Here’s how. Sleep apnea can have a negative impact on both your overall health, and your personal relationships as well. 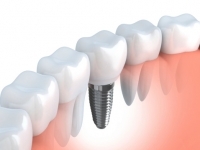 How Many Dental Implants Can I Get? With dental implants, it is possible to replace just a single tooth, multiple adjacent teeth, or even a full upper or lower jaw of teeth. Our Surrey dentists often recommend electric toothbrushes to patients to help them better clean their teeth. Here are a few reasons why electric toothbrushes have an edge over manual ones. If you’ve lost a tooth or had to have one extracted, the most beneficial thing you can do for your overall oral health is to fill the space left behind. Here are some tooth replacement options to choose from.